It's like the feeding frenzy of sharks when they scent blood in the water. 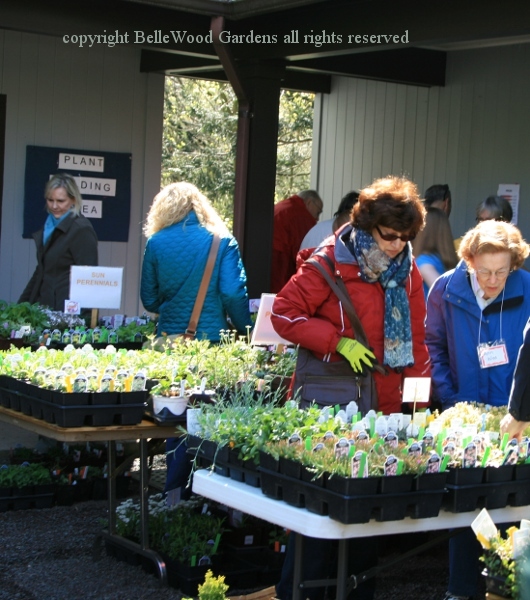 The once-a-year plant sale held at the Leonard J. Buck Garden and co-sponsored by the Watnong Chapter of the North American Rock Garden Society is a must attend event for enthusiastic gardeners. 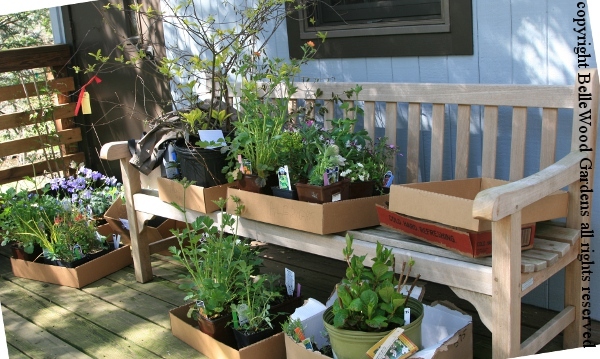 Plants are brought in from a variety of specialty nurseries. 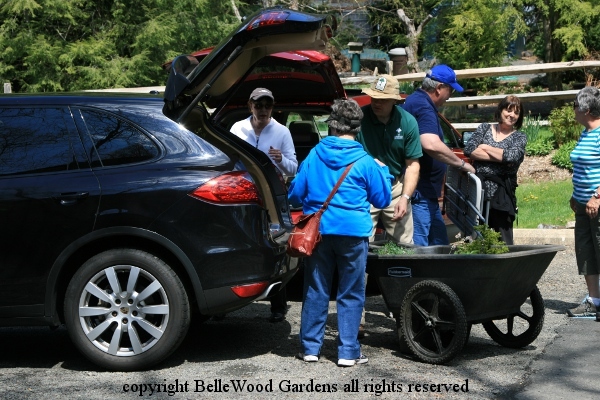 Plants are donated by Watnong members (keen growers with many good plants already in their gardens.) All plants are inspected by a New Jersey Department of Agriculture horticulturist. Some of the eager shoppers are, as might be expected, Watnong members. Others, perhaps, saw one of the posters announcing the event - in area garden centers, libraries, post offices, car windows. And others are regulars who come year after year, to buy that new, unusual, fascinating, gotta have it plant for their garden. They queue up behind a rope, waiting for the 10:00 a.m. start-your-shopping moment. The rope is removed, the crowd surges forward. Let the shopping begin! The signage is terrific. 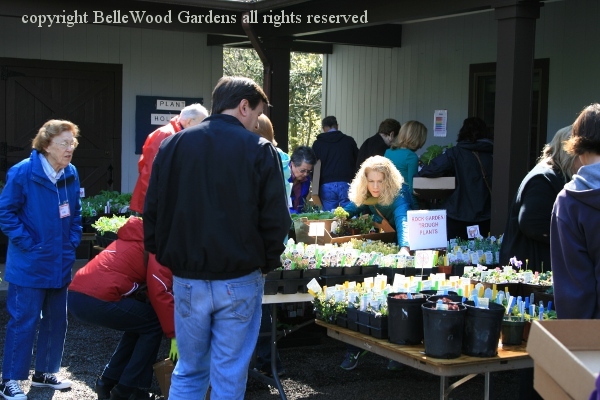 Groups of plants are marked for sun, shade, rock garden, native, ground cover, and more. Those that are resistant to deer browsing (I don't think there is anything that it completely deer proof!) are specifically marked out. 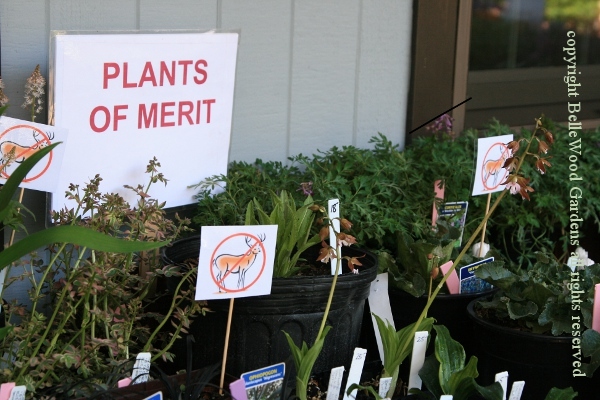 Every plant has a name label. Every pot has a color coded pricing label. Get a box and shop! Perusing the plants. Some people come with an idea of what they're looking for. Other come expecting to be pleasantly surprised. Neither group is exclusive. Know what you want and still be surprised by an unexpected treasure. Just keep in mind what my mother used to say: "If you see something you loke and you can afford it, buy it. Next time, it might not be there or could be more expensive." There's a deck behind the visitors center building, just to the side of the sale area. It serves as a holding area so people may conveniently shop for more than one box of plants. There's even someone plant-sitting the area so no one can "accidentally" shop in the set-aside plants. 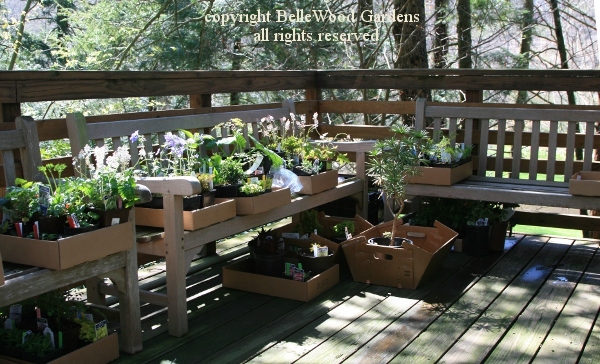 Once the perimeter of the deck is cluttered up with plants people start to use the bench. Boxes filled, total added up, payment made. Now it is time to bring your car around and fill it with your newly acquired treasures. Then home, to plant in the garden. 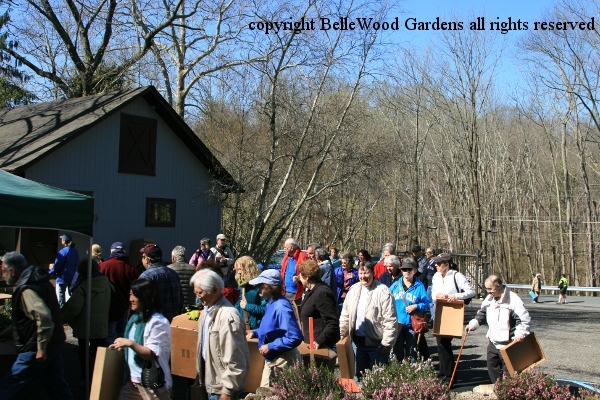 Memories of a good morning at the plant sale, which continues this afternoon and again on Sunday. And remember, there's always next year! See you then.